More advisors are interested in learning about the benefits of Independence, but they often wonder if it's as easy and profitable as they are told it is. 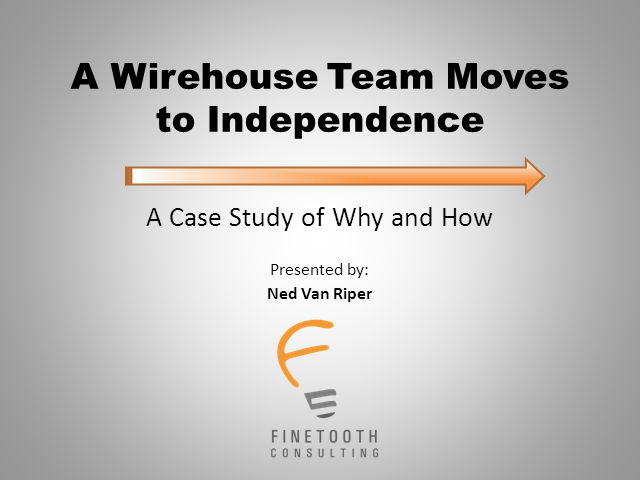 In this educational webinar, we will examine a 3-person team's departure from the wirehouse and their subsequent move to independence. Most importantly, we will detail what they went through during the due diligence process and how they finally chose the firm they are aligned with today. We will address what the process of conducting due diligence on independence looks like. As a result, wirehouse advisors will be armed with more information to assist them in taking the next step towards identifying their next business partner, whether it's an independent broker/dealer, institutional custodian, plug-in opportunity or a hybrid platform.